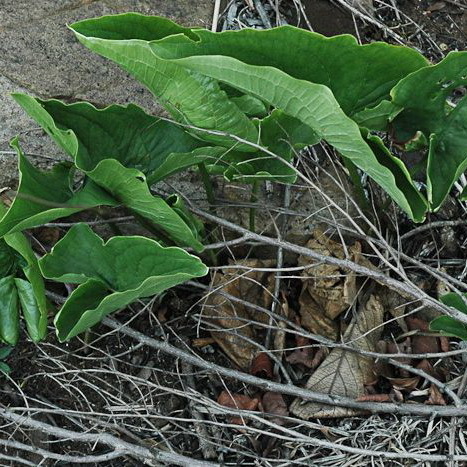 The Bushveld arum, Stylochaeton natalensis, prefers a well-drained soil in semi-shade. This unusual plant will add variety to a rockery. Stylochaeton natalensis is a perennial herb, growing from a vertical, underground rhizome. Leaves resemble that of the (Zantedeschia sp), hence the common name. 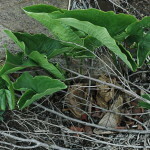 The inflorescence that is also arum-like, is borne on a short stalk and arises from among the leaf bases; the spathe is narrow, greenish to pale yellow and distinctly swollen at the base. It is vey short-lived. The Bushveld arum prefers a well-drained soil in semi-shade. This unusual plant will add variety to a rockery and must be kept on the dry side.